Blondie and Brownie: Lunch with Hellman's & A Giveaway! 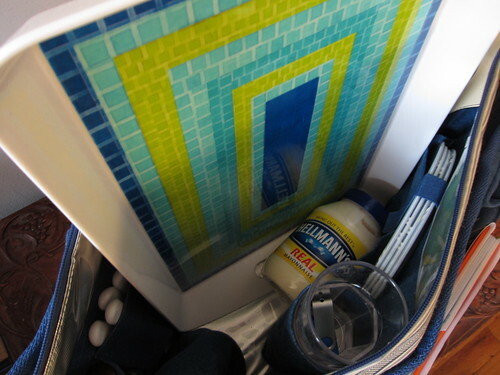 Lunch with Hellman's & A Giveaway! 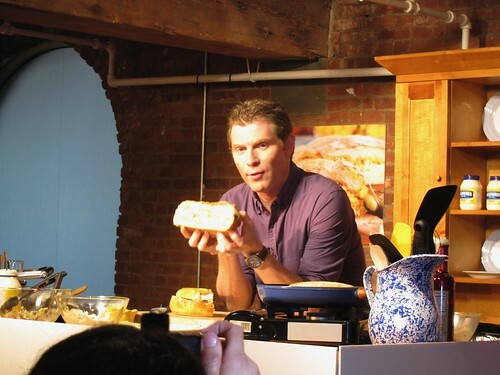 Two weeks ago, I was allowed to have lunch on behalf of Hellman's and Bobby Flay. I come from a Hellman's house, so this was a no-brainer. They're still promoting their Build the Perfect Sandwich Sweepstakes, so we got to eat sandwiches from Bobby Flay's recipes. We watched Bobby do his thing at a small kitchen station as slices were handed out. My personal favorite was the Cuban, probably because it was grilled and toasty. Afterwards, it was time to create our own and to get an awesome gift bag that I want to give away to one of you! 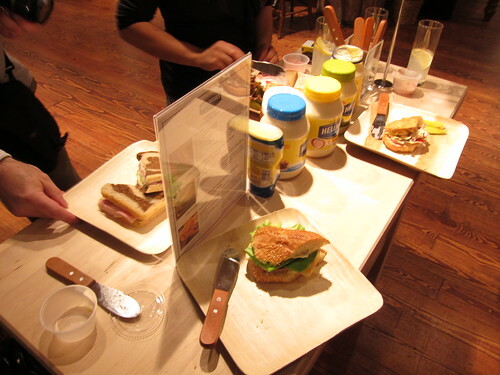 The sandwich stations were packed with fresh cold cuts, breads, toppings, and of course the Hellman's line. I chose to make a chicken and roast beef sandwich on a baguette, topped with their olive oil mayo (personal note: I love this stuff!) and potato sticks. Potato sticks still take me back to being a kid and placing them on my tuna fish! After that fun time, they gave us gift bags. This isn't an ordinary bag, it's for picnics! 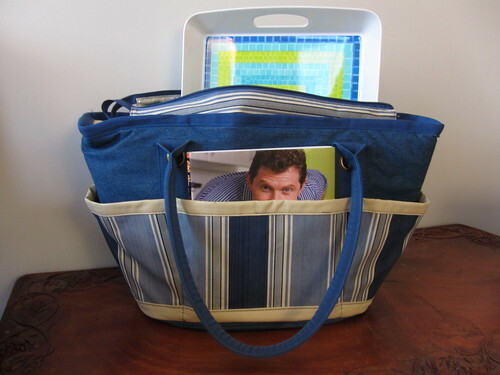 The bag comes with glasses, plates, utensils, a mat, a fancy serrated knife, a tray, and Bobby Flay's cookbook. Since we love our readers, I decided this was destined for giving away! The bag is a tad heavy and with so many little pieces, this giveaway is only open to NYC residents (I will most likely have to drop this baby off with the winner). Email us at Blondieandbrownie at gmail.com by Friday 8am, and we'll pick a winner! And yes, you will also get the jar of Hellman's. Here's to summer picnics! That's an awesome bag. I wonder where I can buy one of those (seriously). you are in love with potato sticks! Another Hellman's house right here - thanks for sharing the loot! "In the Small Kitchen" Contest! It's Spring and Pie is in the Air! Don't Forget, this Sunday is Mother's Day! Big Gay Ice Cream Truck Returns!